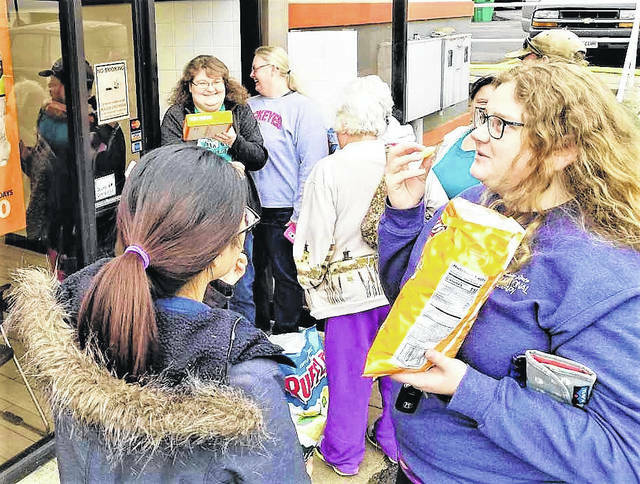 Customers eager to cash in on Monday’s free pizza giveaway were lined up at Portsmouth’s Gallia Street Little Caesars location. Pizza and basketball fans alike were happy about Little Caesars’ lunch giveaway Monday as part of the pizza chain’s March Madness “If Crazy Happens” promotion. For those who believe “there’s no sure thing” and “there’s no such thing as a free lunch,” well, you’re half right. Little Caesars bet that there was a sure thing in March Madness — they call it March Madness for a reason — when the national pizza chain wagered on the biggest long shot in NCAA basketball history. If a No. 16-seeded team could beat a No. 1-seeded team, the fast-food pizzeria would treat everyone to one of its $5 lunch combos. Monday, the nation’s third-largest pizza chain was handing out a free lunch. The pizza chain’s 5,463 nationwide locations had three weeks to prepare for the payoff after No. 16-seed University of Maryland-Baltimore County defeated No. 1-seeded University of Virginia on March 16 in the first round of the NCAA Tournament. The Portsmouth location was handing out free four-piece deep dish pepperoni pizzas and drinks as quickly as customers could get to the counter or the drive-thru window. Customers were lined up out the door at the Gallia Street location throughout the two-hour lunch period. The local Little Caesars location directed inquiries about the number of pizzas given out Monday to the regional office, Goodwin Family Foods. Multiple messages left at Goodwin were not returned by press time, but those who showed up between 11 a.m. and 1 p.m. did not go away hungry. Little Caesars’ “If Crazy Happens” promotion was supposed to be a sure thing. Since the NCAA expanded to a 64-team bracket, no No. 16 seed had ever beaten a No. 1 seed. NEVER. EVER. The No. 16 teams were winless in 135 previous meetings. The first-round matchup against a No. 16 team had previously been merely a formality for No. 1 seeds. That was until UMBC shocked the college basketball world with the biggest upset in NCAA history — and by 20 points! The sure thing became the “almost everytime” thing, and the free lunch that wasn’t supposed to exist became reality — because crazy happens. 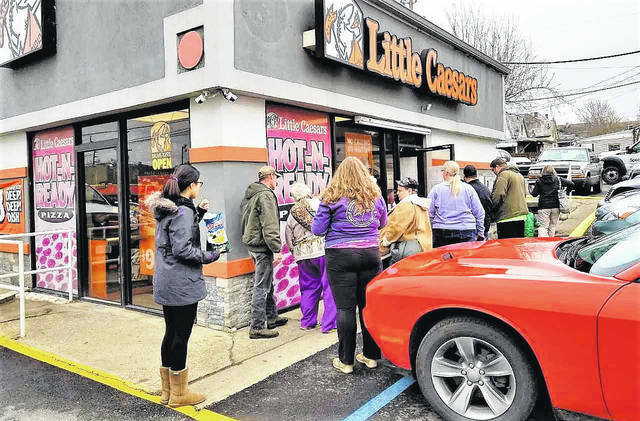 https://www.portsmouth-dailytimes.com/wp-content/uploads/sites/28/2018/04/web1_Little-Caesars-crowd.jpgCustomers eager to cash in on Monday’s free pizza giveaway were lined up at Portsmouth’s Gallia Street Little Caesars location. https://www.portsmouth-dailytimes.com/wp-content/uploads/sites/28/2018/04/web1_Little-Caesars-giveaway.jpgPizza and basketball fans alike were happy about Little Caesars’ lunch giveaway Monday as part of the pizza chain’s March Madness “If Crazy Happens” promotion.